DCP South Delhi Vijay Kumar issued a statement to confirm the death. He said, "Rohit Shekhar Tiwari, son of late former Uttar Pradesh and Uttarakhand CM ND Tiwari, has been brought dead to Max Saket Hospital." Rohit Shekhar Tiwari, son of former chief minister of Uttar Pradesh and Uttarakhand, ND Tiwari, died on Tuesday. Rohit Shekhar Tiwari, son of former chief minister of Uttar Pradesh and Uttarakhand, ND Tiwari, died on Tuesday. Rohit passed away in New Delhi less than six months after his father died at the age of 93 in October last year. Rohit Shekhar was brought dead to Max Hospital in Saket. “Rohit Shekhar Tiwari was brought to Max Hospital, Saket, around 5 pm in an ambulance. 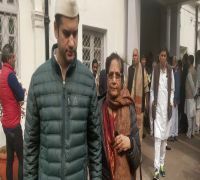 His mother Ujjwala Tiwari was already in Max Hospital Saket for her personal treatment where she received a call from home that Rohit is unwell and bleeding from nose, and an ambulance call was also made by them. “Upon this she reached her residence in Defence Colony along with an ambulance which brought him to the hospital. However, upon arrival, he was declared brought dead by the duty doctors at Max Hospital,” according to the DCP South Delhi. The police have seized Rohit's Defence Colony residence. Investigators are searching the house to look for reasons behind the death. ND Tiwari passed away in 2018.